Continued Scariness | Leah Palmer Preiss ~ Curious Art: Detail of acrylic on collaged paper on canvas, 9" x 12"
Continued Scariness Detail of acrylic on collaged paper on canvas, 9" x 12"
More denizens of my painting-in-progress! This section is about 2.5 inches square. I’m excited about this piece because it’s the first of a series I have in mind that will center on words & creatures. 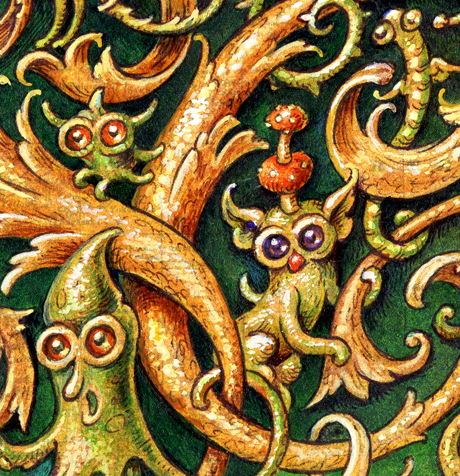 Next in line is the word “Explore”– do you have any favorite words that you would love to see invaded by odd beings? This entry was posted in Process and tagged Acrylic, Etsy, Halloween, Illumination, Monsters, Process on 8August 2014 by Leah. The multiple colors and hatch marks give a wonderful looseness within the confines of outline. I love it so much (outline and looseness within the same painting, I mean). “Chiffarobe”; a favortite word (and object) that needs an invasion, okay? Chiffarobe IS a wonderful word– filing it away for future verbio-visual madness! Thanks so much! Ahhh, the best medicine, to counteract all the yucky ones. Thank you, Marny, I’m so happy to have provided a laugh!